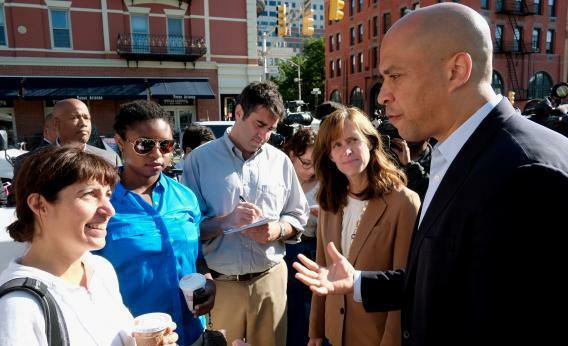 Cory Booker teachers unions: Liberals don't like New Jersey's next senator. HOBOKEN, NJ - AUGUST 14: Newark Mayor Corey Booker greets people along with Hoboken Mayor Dawn Zimmer at the Hoboken PATH station after winning the Democratic primary for U.S. Senate on August 14, 2013 in Hoboken, New Jersey. Molly Ball had a smart piece last week wondering why liberals seem to have such antipathy to Cory Booker based on ideological deviations that are really quite small in the scheme of things. But while puzzling over this, she actually identifies the answer and then skips past it. Liberals don’t like Booker because he’s an education reformer—a board member of Democrats for Education Reform, a group that pushes charter schools and test-based teacher assessments and other ideas that labor unions representing America’s teachers don’t like. Ball dismisses this as inadequate to fully explain the depths of the antipathy on the dual grounds that Barack Obama is also an education reformer, and that this particular issue doesn’t feature all that heavily in the liberal critique of Booker. Both are true, but it’s still the case that this is what’s driving things. The basic issue here is that not only is the education reform issue itself contested in the Democratic Party, there’s a deep divide over how to frame the divide. Reformers like to see it as unions standing in the way of the interests of minority kids. That makes people of color such as Booker, Sacramento Mayor Kevin Johnson, DC Schools Chancellor Kaya Henderson, etc. particularly valuable faces of the cause. By contrast, liberals prefer to see the issue as pitting billionaire donors against the interests of middle class workers. Their ideal antagonist is someone like Michael Bloomberg. Given Cory Booker’s age and ethnicity, it is overwhelmingly likely that he will be an important figure in this debate for years (if not decades) to come. So there’s a lot at stake in painting Booker not as a fairly conventional Democrat who (like Barack Obama and lots of other Democrats) happens to disagree with teachers unions about K-12 issues. Instead, they want to paint Booker as an across-the-board demonic corporate sellout figure who disagrees with teachers unions as part of a general agenda of overclass madness. When I did a post a couple of weeks ago about how Cory Booker’s campaign featured a lot of earnest discussion of child povery and smart ideas to reduce it—a post that said nothing at all about education policy—I got some negative feedback from some people who I normally disagree with about K-12 school management policy. It was very important to liberals who disagree with Booker about education policy to believe that his interest in child poverty is insincere or disengenuous, because if it’s not that they might also have to think that his interest in education reform is sincere. A young black senator whose signature issue is child poverty and who disagrees with the unions about education policy is a disaster for their side of the argument. Of course you could say the same about Barack Obama. But that horse is already out the barn door. Despite the enormous volume of from-the-left criticism of Obama on the Internet, his approval ratings among Democrats remain in the high-80s. Emphasizing the extent of the union-Obama gap on education would only hurt the union cause. But Booker is still being defined in the public eye, and to folks who disagree with him on education it’s important to define him as a Friend of the Fatcats rather than a Friend of Poor Low-Income People.